Our flight departs Kalbarri airport and along the coastal cliffs before heading off over the ocean to the Abrolhos Islands. We land on East Wallabi Island, where we meet our boat skipper for a 3 hour boat tour of the Islands that make up the East Wallabi Group. The Islands have been made famous by the wreck of the Batavia in 1629 and the subsequent mutiny. Visit the islands, including the Batavia wreck site, Beacon Island, Long Island and West Wallabi Island where the remains of a makeshift fort can still be seen that was used by shipwreck survivors to fend off the mutineers! 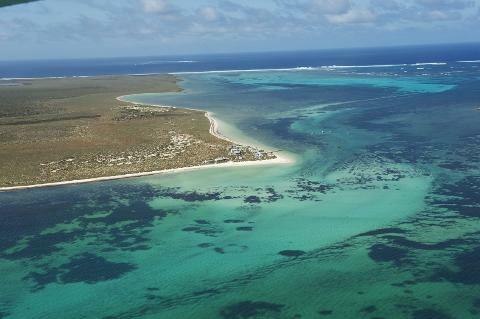 Land on East Wallabi Island where you join a 3 hour boat ride, pulling Western Rock Lobster (crayfish) pots and enjoy a delicious crayfish lunch. Return to our aircraft for a scenic flight over the islands before heading back to the mainland and Kalbarri Airport.